JOIN US FOR THE NYIRAGONGO DISCOVERY TOURS: We Save Your Time & We Save Your Money. Day1.Arrival in Goma or Gisenyi On your arrival to Gisenyi,western town of Rwanda or Goma in D.R.Congo; you will be met with your personal Guide. He will help you for every thing you need to organize well your trip. Overnight in Goma or Gisenyi. Day2. 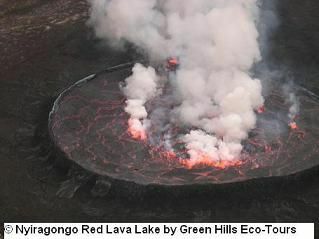 Hiking the Nyiragongo volcano Today, Have an early breakfast and transfer to Kibati park station. After a briefing with park rangers, start Hiking Nyiragongo volcano (climb takes about 4 to 5 hours). Hike through an impressive rain forest, the climb continues on the lava eruption fissure until 2002, reach the summit; explore the giant crater of Nyiragongo above its violently red Lava Lake then descend down. Day 1: Your Arrival in Goma or Gisenyi town On your arrival to Gisenyi,western town of Rwanda or Goma in D.R.Congo; you will be met with your personal Guide. He will help you for every thing you need to organize well your trip.Overnight in Goma or Gisenyi. Day2: Climb Nyiragongo At 8 o’clock, After breakfast, meet and Have introduction on the activities of this day.Go for shopping; then transfer to Kibati park station. After a briefing with park rangers, start Hiking Nyiragongo volcano(climb takes about 4 to 5 hours). Hike through an impressive rain forest, the climb continues on the lava eruption fissure until 2002, reach the summit. After breakfast, Descend down from Nyiragongo, meet our driver to Kibati then go for Goma Sightseeing Tours which gives you an insight of the 2002 eruption that destroyed a large part of Goma town.Visit Local market;and Return to your hotel where the tour ends. This tour will give you a great opportunity to explore the giant crater of Nyiragongo above its violently red Lava Lake and learn more about Nyiragongo story.Overnight in shelter at the summit. Day3: Full day at the volcano summit Today you have a full dayto explore the giant crater of Nyiragongo above its violently Lava Lake and learn more about Nyiragongo & Nyamulagira; both still active volcanoes and more dangerous in the world. Overnight in shelter at the summit. Green Hills Eco Discovery Tours will give a profound look at all of Congo countries' diverse treasures. If you are interested in these Tours and would like more information an reservations;please contact us we will send you additional information about the Tour as soon as possible.or just tell us what you need we can help you. Thank You! We are specialists in organizing all kinds of tours in East Democratic Republic of Congo. Green Hills Eco-Tours offer guided Tours for individuals,families and small groupes..